The M20 is a feature packed alarm system including an engine immobiliser, offering protection against break in and theft of and from the vehicle. 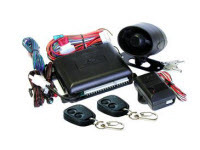 Supplied with 2 security keys to disable the sirens battery should you need to change the vehicle battery. The M24 is fresh on the market and is a 24-volt version of the highly popular M20. It is only suitable for 24-volt vehicles. Responder HD features Viper's most advanced colour remote, operating a one-mile range, 2-Way security and remote start system with an upgraded user interface, mini-USB charging port and patented menu wheel. 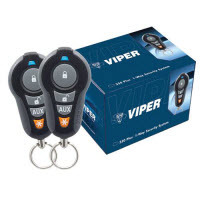 No effort has been spared by the Viper development team to create the ultimate colour keychain remote control, operating Viper's top-of-the-line, one-mile range 2-Way vehicle security and remote start system. Built-in Info Centre: the Responder HD status screen has an information centre built into it! The Info Centre displays the remote start run-time remaining before the engine shuts off, as well as the vehicle interior temperature, so you know if it has warmed up or cooled off enough to make your drive comfortable. It also displays the Countdown and Parking Meter timers when running, and the Parking meter timer emits warnings at 15 minutes, 5 minutes and at expiration so you can make sure to feed the meter. Also, you can stop, start or clear these timers any time in the Status Screen using the Menu Wheel. These 4 bits of information can be displayed in the Info Centre by pressing the menu wheel while the Status screen is active to toggle and show each one. The intended use and user value of Viper Responder HD constitute nothing less than a new higher level of connection between drivers and their vehicles. Responder HD is a new level of luxury in the world of vehicle security and convenience. From up to one mile distance from their vehicle, users can stay in constant contact using an advanced and elegant, full-colour interface device: their Responder HD keychain remote. Responder LC3 – the 3rd generation of Responder, complete with SST One Mile Range, the new Priority icons and text seen on a 20% larger liquid-crystal display, an on-board lithium-ion rechargeable battery with mini-USB recharging – all in the slimmest display remote on the market. Combining the best features of Responder with all the "New Technology Platform" advances introduced with the Best of Innovations Award-winning Responder LE, Responder LC3 systems come with one 2-Way LC3 SST one mile range remote and a companion 1-way long range remote. Responder LC3 lets you command and monitor your vehicle like never before, with our Priority icons – simple and prioritized for easy use - plus clear text labels on the large LCD screen. With the Priority™ User Interface, the five buttons control 24 functions on each of two cars! And with the Priority Icon Map™, the most important icons reside in the centre of the large LCD screen, 3 times larger than the less-critical icons positioned on the edges of the screen. It's undeniably the most sophisticated one mile range LCD remote ever! In remote start mode, if Active Temp Check is selected, Responder LC3 will display Temperature (in either Fahrenheit or Celsius) instead of the time (the default display). Now you can see the actual temperature inside the vehicle, before walking through the weather to get to it! If it isn't warm enough inside your car yet, use Runtime Reset to extend your runtime. Don't worry about forgetting about your car – Responder LC3 reminds you 3 minutes before your time runs out, with an audible tone, a vibration, and on the screen. If anything happens to your vehicle, Responder LC3 notifies you right away if you are within range, playing the Revenger siren tones from inside your pocket. If anything has happened to your vehicle during your absence, LC3 spells out what happened when you unlock your doors: "Shock Sensor" for example. Or you can silence your car's siren and only be alerted on your remote, with Silent Mode2 siren-less arming. Arm your alarm with the door open and Responder LC3 will alert you – audibly and with large readable text: "DOOR OPEN". Responder LC3 gives you an unprecedented level of control. Only the important icons are displayed - unused icons disappear from the screen to keep the display clean and simple. "Ghosted" icons – outlined icons only without their typical solid body - indicate that you’ve changed something. For instance, while a solid padlock icon shows your alarm is armed and your doors are locked, an outlined padlock indicates your doors are locked in Valet Mode. The words "Valet Mode" appear to make sure you're clear on the status of your car.